You might have heard of the 80/20 rule. 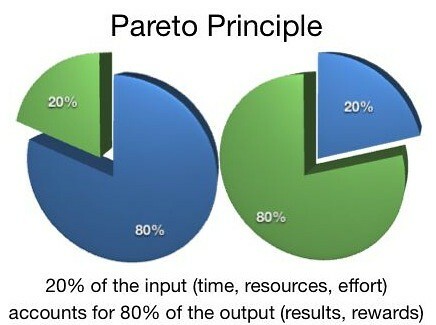 Also known as the the Pareto Principle, the 80/20 rule has a variety of interpretations and implications throughout business, economics and popular teachings. In general the rule states that, for many events, roughly 80% of the effects come from 20% of the causes. In health care in the United States, it has been found that 20% of patients use 80% of health care resources. Several criminology studies have found that 80% of crimes are committed by 20% of criminals. In Microsoft by fixing the top 20% most reported bugs, 80% of the errors and crashes were eliminated. In his book, Tim Ferriss recommends focusing one's attention on those 20% of things that contribute to 80% of a person's income as well as letting go of those 20% of customers who take up 80% of one's time and cause the most trouble. I can get a tremendous amount of work done (80%) in a very short period of time (20%) when I am passionate, focused and free of worry. However, when I worry, procrastinate and nit-pick at stuff I find myself spending a huge amount of time (80%) on a very small amount of work (20%). I found this was especially true with the Unofficial Handbook, writing on this blog and working on projects. The take home lesson for me has been focusing on the passionate 20% time and letting go of the worrisome 80% whether I am writing, working on projects or trying to prioritize my time. If you find yourself worrying, agonizing over the tiniest details, or getting stuck in some random fear, feel free to label it as that 80% and let it go. It's probably not worth it in the long run.